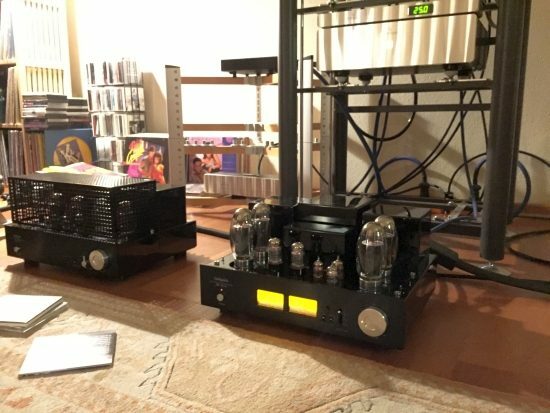 For this part of the review, I opted to take the biggest of the two Push-Pull designs to audio buddy JW’s (aka herr Tube-Doktor) apartment and test them with his original Apogee Duetta Signature magnetostatics. I could have also taken the SETs but that would have meant double the lifting work and from experience, I know that Apogees like copious amounts of current and require more control than any SET amp used so far can deliver. By now I have an almost infinite faith in the power of the Line Magnetic SET amps but if a 52B amp such as the Ayon Crossfire can’t control them sufficiently and not even a Dual-52B P-SET amp such as the Vaic Reference 520 does the trick, then it’s safe to assume that SET amps, in general, are just not ideal for such power-hungry, inefficient speakers. 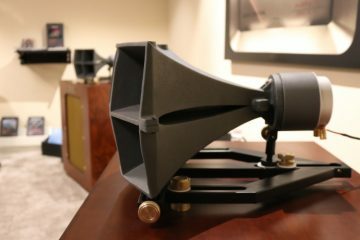 Much to JW’s and my surprise, though, we found that the Push-Pull Audio Research Reference 75SE, and later also the PrimaLuna DiaLogue Premium, worked surprisingly well with these speakers. 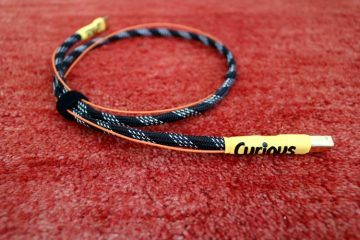 This instilled the confidence to assume that both Line Magnetic Push-Pull designs should also be powerful enough. And sure enough, that would prove to be the case… and then some! 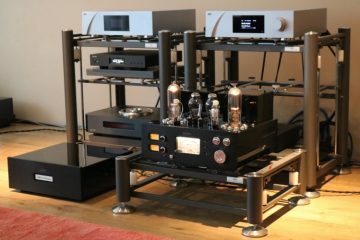 As his normal setup, JW uses a Jeff Rowland Synergy IIi preamp with a custom BPS-2 Battery Power Supply and the aforementioned ARC Ref75SE power amp. 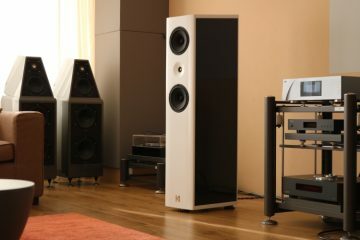 The latter uses a conservative bias setting which allows the quad of Tung Sol KT-150’s to deliver 2x 75 watts per channel. While a high enough rating in itself, this does not offer a huge amount of overhead when combined with Apogees and it’s certainly not enough for highly dynamic classical symphonic recordings. For the large majority of more compressed contemporary recordings, however, this is more than enough, even when playing quite loudly. The source is a Wadia 861 CD player, normally connected via Cardas Clear XLR to the ARC amp. For this occasion, I brought an AudioQuest Water cinch cable. Because the Synergy preamp only has XLR connections and I did not want to resort to using adapters (as I know that the Synergy with its transformer-coupled outputs does not sound its best when its negative output is shorted to ground) I chose to bypass it completely and use the Line Magnetic amps as complete replacements of JW’s pre- and power amp. 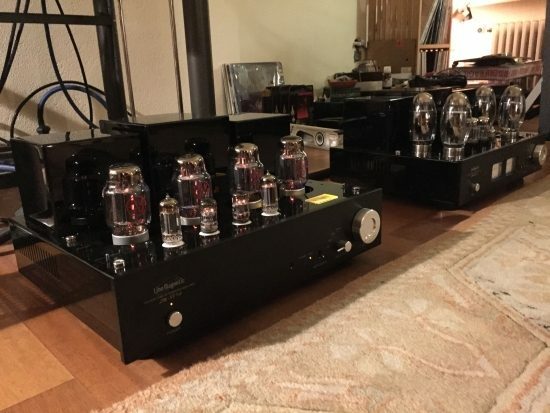 The upside of this was that this would also allow the Line Magnetic amps to shine in their full glory as they replaced a high-end system costing multiples of its moderate retail price. 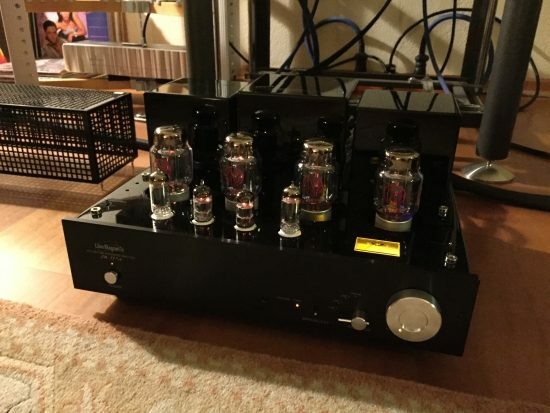 From experience, I know that tube amps sound best with Apogees using the 4-ohm outputs so that’s what I tried first and indeed I’ve not had a reason to change this. 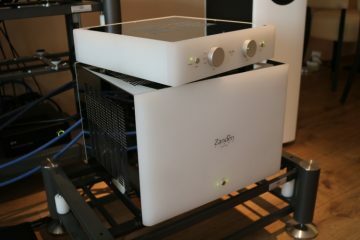 We were eager to get going so the listening commenced right after having listened to the usual system, changing amps and switching on – this amp was not granted a warm-up period. As it turned out, it did not really need it either. Woooow! was the first thing I exclaimed, and it was clear that JW felt the same way. The sound was fuller, more voluptuous and considerably more ballsy than with his own combination. The bass was significantly more powerful and more solid, connecting seamlessly with the midrange that was gloriously rich and colorful, ending in a treble that was as smooth and fluid as it was open and airy. And in spite of all the tonal fulness, PRAT was also spot-on. The sound was not hurried nor was it slow. This was an upbeat and articulate delivery! Also, the soundstage was perhaps not wider than it was with the Rowland-ARC combination but it was absolutely deeper and more clearly layered back to front with vocals and instruments being portrayed as true 3D bodies. Two minutes later we were both in awe. How was this possible? 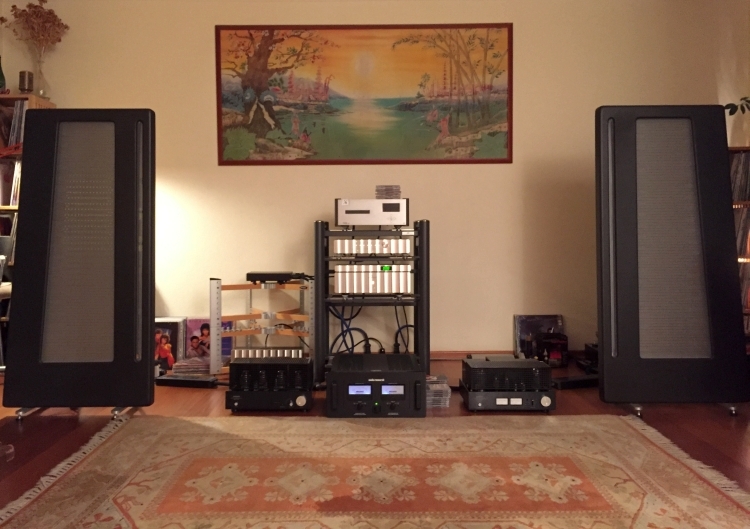 We just bypassed the high-end core of this system, retaining only the Wadia CD player and there was just not a single downside to the LM-150IA’s delivery! With every track that we played, we got sucked ever more into the performance. Oh, and the amp had plenty of power, too! With such a delivery, the emotions take over and the mind stops polling for ticks in audiophile parameter boxes. But even when I did engage my audiophile paranoia, I could not find fault with this delivery. In every aspect, it was simply more real and utterly convincing. If pressed it could be argued that the Rowland/ARC combination was a little bit more transparent and refined still but the combo definitely sounded flatter, less involving, less “live”, and in effect, actually more “transistor”-like. Every now and then, I am so smitten with a review product that I must have it and I make it a permanent part of my system. For JW, however, changing his system is ultra-rare. He is the kind of person who deliberates for years, then decides on a component and then spends years getting it to fit in perfectly with the rest of the system. But at the end of this particular listening session, he decided to buy an LM-150IA and actually did just that the next day. How’s that for a recommendation? 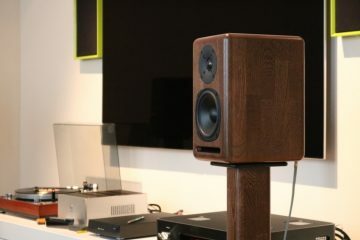 We also tried the LM-88IA with the Apogees and while it seemed to be at least as powerful as the ARC Ref75SE while providing a bolder, more powerful bass and a smoother, tonally fuller sound, with these speakers the amp just had to bow to its bigger brother, as it simply performed on a higher level on all parameters. After the shock that preceded it with the LM-150IA, we could not go back anymore. Such is life, I guess. Regular readers will know how many other amplifiers I’ve tried with the Duettas, some of which had truly great bass or impressive dynamics, the Soulution 711, for example, was brilliant and Analog Domain, NuPrime, and PrimaLuna also deserve special mention but I’d still pick the Line Magnetic amp over all these for its overall performance. At this point, I think there is no way around concluding that all these Line Magnetic amps are truly excellent, all-powerful enough given good speaker pairings and all of them are crazy good value for money. But there’s more! 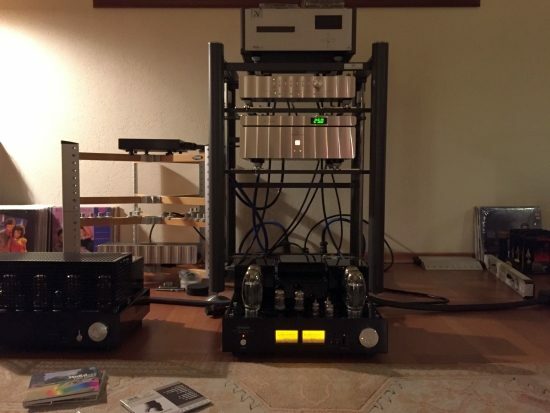 Near the end of this review, Frank also delivered “His Precious”: the two-box LM-845 Premium. 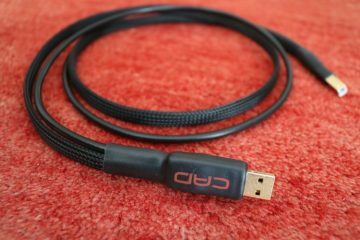 How does LM 805ia compare with LM 150ia in terms of matching with Duettas?What makes LM 150ia a better match in comparison to 805ia? The 805 is a SET amp (a single tube per channel) and, like all the other SETs that I tried, it does not have the current and damping factor to drive the relatively inefficient Duettas well. It works and nothing breaks but it sounds overly smooth and rounded overall and slow and ill-defined in the bass. 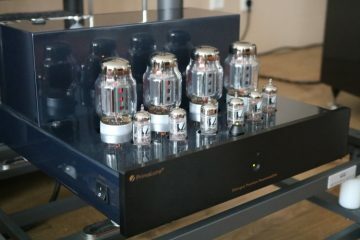 The 150 is a push-pull design (two tubes per channel that work together) using KT150’s which I believe are the most powerful tubes that currently exist. With this configuration, the LM150IA has plenty of power to drive the Duettas very well, except when playing extremely loudly with extremely dynamic material. 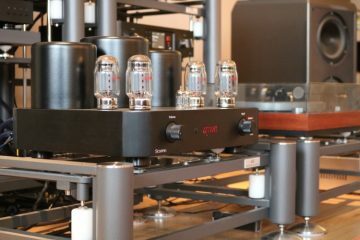 Like all medium power tube amps, the amp can run out of steam when playing extremely dynamic bursts on the low-efficiency Apogees but because it is a tube amp, it will never distort in a harsh manner.